Has Apple finally come around to thinking bigger is better? The front panel of the new iPhone has apparently been leaked online in a video, revealing that Apple's next handset will indeed be taller than the iPhone 4S. 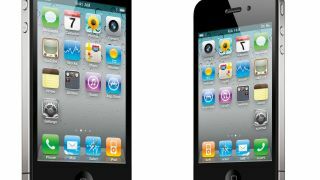 We've heard a number of rumours suggesting the iPhone 5 will grow in height over the iPhone 4S so the handset can accommodate a bigger screen, and previous leaks of the supposed chassis would seem to confirm this. Now ETrade Supply claims it has received the front plate of the next-generation iPhone from "reliable sources" (always dubious) – and measurements reveal the screen area to be 4.065-inchs, providing a 16:9 aspect ratio, which would be perfect for watching movies on. Although taller with a reduced bezel above and below the screen, the leaked part shows that the sixth-generation of iPhone will still be the same width as the iPhone 4 and 4S, although the glass front panel itself is 0.1mm thinner than on previous handsets – suggestion the iPhone 5 may be the slimmest Apple phone yet. We've also heard rumours which suggest the front-facing camera will sit in a new, centralised position above the ear-piece on the next iPhone - and this layout is mirrored in the part leak. Of course it's relatively easy for someone to spoof a part like this, so there's absolutely no guarantee that what is shown in the video is actually the real deal. The new iPhone is expect to arrive in September or October, with an Apple event hotly rumoured for September 12. Take a look at the video in question below, and make up your own mind on whether it should be believed or not – plus check out the dude's rubber fingers, why not just use the traditional rubber gloves? Bizarre.